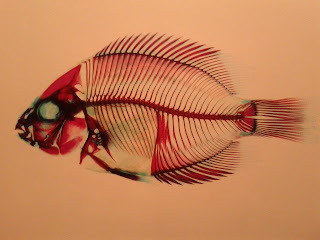 I was excited to be invited back to another tweetup at AMNH last night. This time, I was able to get Vance to come with me and I think he had a pretty good time. The tweetup was about "Picturing Science: Museum Scientists and Imaging Technologies", a vivid photo exhibition of specimens and phenomenon. And yet again, I have forgotten to bring my camera. You know, after I've got my Nexus S, I have barely used my camera. I just need to remember that sometimes my phone can't take pretty pictures. 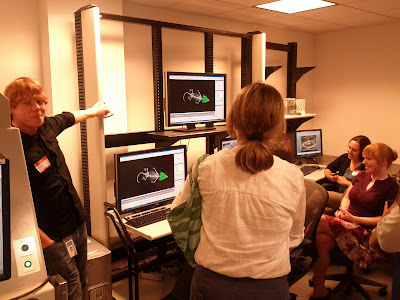 Anyway, we were treated to some behind-the-scene tour of some of the AMNH scientists at work using imaging technologies such as computed tomography (CT) scans, scanning electron microscope (SEM), infrared photography and even dyes to color bones and cartilage (staining technique). The latter was my favorite technique as I am quite fond of stained specimens. We picked up a button when we arrived and on the brim of the button reveals the group that we will be part of. I subconsciously just chose the button of a upper mandible of a felid. Bones, bones, bones. So we were assigned to Group #2 for a behind-the-scene tour. But before the tour, we gathered at Akeley Hall of African Mammals to mingle. There was, of course, wine and cheese. Oh yea, it's classy like that. Led by an ichthyologist and an entomologist graduate students, the first stop for this group was a classroom-like setting where we were treated to amber, flies, ants and stained fishes. Sweet. I got to hold a piece of Baltic amber that encases a pair of flies that are still in the heat of copulation. Pretty rad. There was also amber that encases a species of previously undescribed ant. That guy has a massive pair of mandibles. 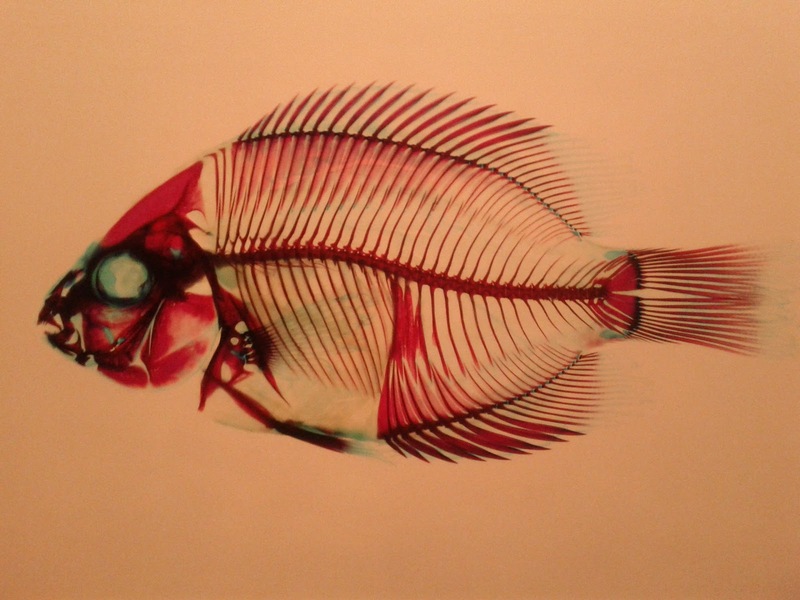 We also spent some time looking at stained fishes under the microscope, although the staining technique itself is sufficient to show the complexity of fish osteology. "Fish bones are jigsaw puzzle from hell". Yep, that pretty much sums it up along with articulating a snake. The staining technique uses red dye to color the bones and blue dye to color the cartilage. Here's a writeup on how to prepare a stained fish Hidden Blades, Glowing Scorpions and Bug Genitalia: Great Science Images From the American Museum of Natural History. Using a microscope to looking inside an amber. 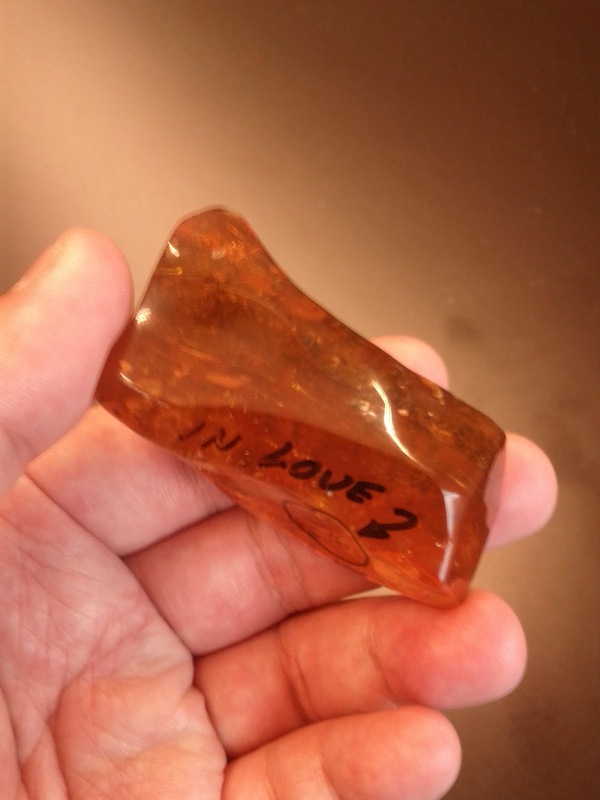 This particular amber has an ant in it. Vance loves ants. So he's particularly excited. I hold in my hand a piece of amber that has encased a pair of copulating flies, hence the "IN LOVE" and an arrow pointing at the two amorous flies. Next stop was the imaging technology area where we got to see some cool microscopes such as SEM and CT scan in action. The SEM was used to produce detailed close-up photos of goblin spider while the CT scan was used to take thousands of armadillo lizard x-rays. These x-rays are later incorporated into a 3D program to produce a comprehensive 3D image of an armadillo lizard. Pretty neat stuff. 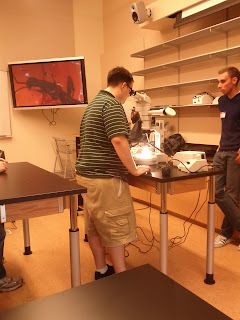 There was also a microscope that they dubbed "microscope on steroid" and is used to scan comet dust. They mean business there. LOL! Scanning electron microscope (SEM) on the left. Image of the carapace of a goblin spider on the right. Using a CT scan to look inside an armadillo lizard. "Microscope on steroid". Scanning comet dust. As the behind-the-scene tour ends, we were ushered back into the Akeley Hall of African Mammals and got to spend more time mingling and taking in the new photo exhibition. 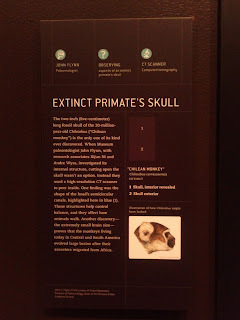 There was a photo exhibit of Chilecebus (Chilean Monkey), an extinct primate and the only specimen of its kind ever found. Using a CT scan, the researchers were able to look inside the skull of Chilecebus to reveal its brain size and the shape of its head's semicircular canal. Chilecebus photo exhibit. Using a CT scan to look inside the skull of the one and only specimen found. Chilecebus skull (left). CT scan reveals the shape of its head's semicircular canal. Brownie points to Denton Ebel, the Curator-In-Charge of Department of Earth and Planetary Sciences for walking us through the exhibition and explaining to us in depth the "Warhol" meteorite photo exhibit. 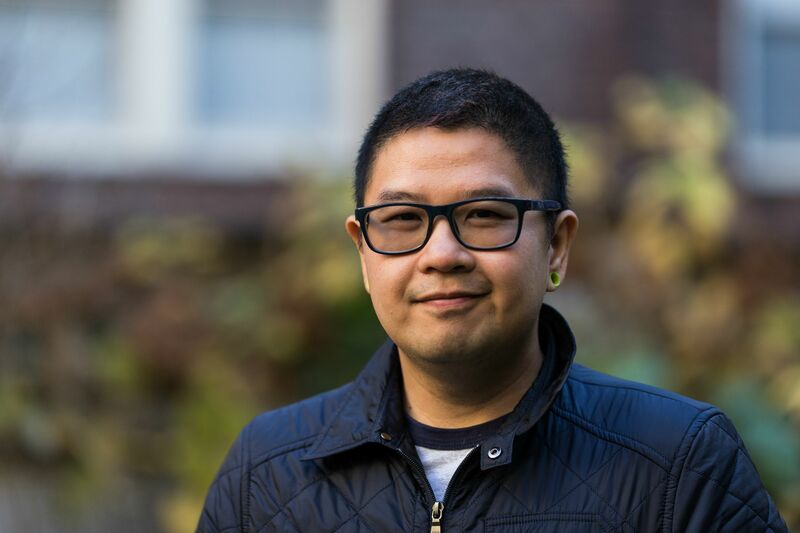 And also thanks for all the jokes "It's perfectly round, just like tears of astronauts in space ... because they missed home". Oh yes, I forgot about the swag. This time we were ushered away with some postcards from the photo exhibition and also a scorpion sucker! Hmm ... I dunno, I don't think I am gonna eat THAT. But thanks for another great tweetup, American Museum of Natural History! Looking forward to the next one. Buttons for the group tour (left). Scorpion suckers as parting gift (right). I dunno, but I doubt it'll taste like chicken. You can follow American Museum of Natural History on Twitter at @AMNH for more info on the museum, upcoming events and also future tweetups. The photo exhibition, Picturing Science: Museum Scientists and Imaging Technologies, opened June 25, 2011 and ends June 24, 2012. It is free with museum admission and opens daily.